A bit of fun, but true, and not at all fun at the time, actually, and now I come to finally write about this traumatic, almost daily school experience, I wonder if someone somewhere set it up as some kind of strange joke in the first place. 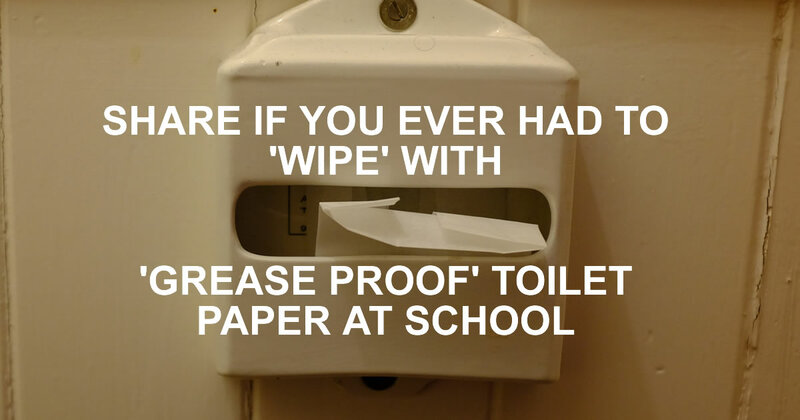 I am talking of course about greased proof paper being provided in the toilets, for (I presume) wiping our bottoms with. Don't know what I'm talking about? You were lucky! I'm not sure if this was just a Whitby thing or even just a West Cliff CP School thing - I'm going to ask on Facebook and find out. So I'm not sure if you will believe me - or think all my screws aren't quite tightened up. But at West Cliff School in Whitby (a state primary school for children aged ~4 to ~11) between the years of 1975 and 1984 (and possibly many years before and since), the sit down loos were fitted with loo paper dispensers which were filled with small rectangles of grease proof paper - with which, I presume, we were meant to wipe our bums subsequent to doing a number two. I won't go into the gory detail but suffice to say, grease proof paper does not provide a satisfactory service in this department. In cookery, where grease proof paper is more frequently used, it does an excellent job of smearing butter around baking tins. In toilet use, it does much the same. So there's a bit of quirky Whitby history for you. And a plea for more information. Do you know when this strange practice began? Why? When it (hopefully) ended? Was it just us poor kids at West Cliff, all of Whitby, or in fact, all of the UK? UPDATE by Joe Ash, December 2015: I can answer this question due to a little known fact that was told to me only this year. Izal "Now wash your hands please" toilet paper wasn't exactly greaseproof paper but I can see where you're coming from. It also had the very nasty characteristic of making razor sharp points if you weren't careful how you used it. But that being said, we have all (well nearly all) been using it incorrectly. Apparently a little instruction and practice was all that was required to make your life wonderful. All you had to do was take a sheet and hold it firmly in both hands. Then put your fists together and 'ruffle' it by rubbing your fists together very quickly. This makes it go all soft and fluffy. A minor hassle, to our modern sensibilities, which I would gladly have undertaken had I been made aware of the technique at the time. All it needed was a little knowledge to make millions of bottoms happier. But then again, that's probably why we grew up to be such 'hard arses' eh? What is the proper name for a water otter?... A kettle.